Here are some of the ways you can keep everybody fed and happy, without complicating your routine. 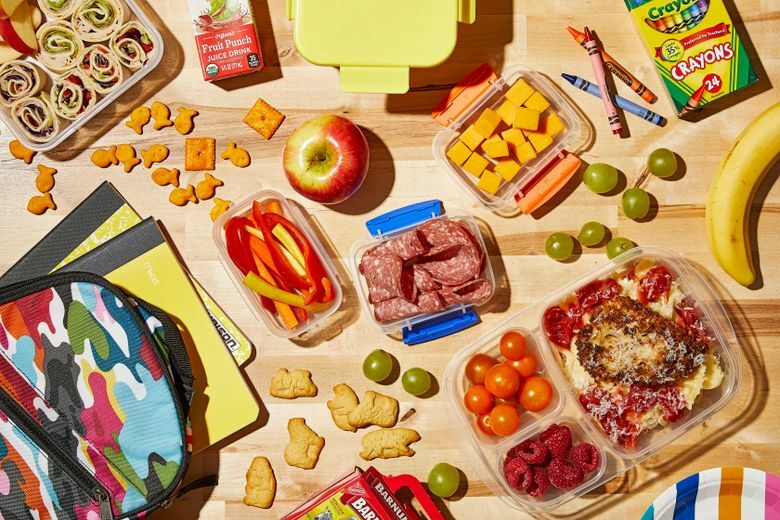 — For kids who prefer to graze, lose the concept of a structured meal. My 4-year-old daughter is happy munching on an assortment of chopped grilled chicken or sliced salami, cheese cubes, raisins, apple slices and crackers. It is kind of like making a charcuterie board for a kid, with a juice box instead of wine. Compartmentalized plastic storage containers or Bento boxes are perfect for lunches like this. — Last night’s leftovers can find a second home in school lunches. I am often thinking about how I will repurpose a meal for lunch before I choose to cook it for dinner, and in many cases I will cook more of it for just that reason. My daughter attends a home day care where she can have her lunch heated up, so dinner leftovers are the easiest thing to send. Some schools offer a microwave for student use; just check with your child, as they may not have time to wait in line to use it. Start by filling the base of a small food storage container with cooked rice, quinoa or other grains. Other things that work are cooked noodles and small pasta shapes like couscous or orzo. — Sandwiches are traditional for good reason. There is no shame in packing a “regular” sandwich alongside chips, a piece of fresh fruit and a drink. (Before you reach for the peanut butter and jelly, just make sure your child’s school has not implemented a nut-free policy.) To fend off boredom, I let my children choose their favorite sliced meats and cheeses from the deli counter, and by favorites I mean whatever is on sale that week. Swapping sliced bread for pita pockets or tortilla wraps can also help break up the monotony. — Keep food safety in mind. Young children are especially vulnerable to foodborne illnesses, so take precautions to keep foods properly chilled (or warm) until lunch time in insulated lunch bags or thermoses. For cold lunches, include a reusable ice pack. Frozen juice boxes and squeezable yogurt tubes can also double as ice packs, which will thaw and ready to enjoy by lunch time. Visit FoodSafety.gov for tips on keeping school lunches safe.